Kizuna AI is the world's premier Virtual YouTuber. She uploads a variety of videos to her YouTube channel, named A.I. Channel, in a similar format to other popular youtubers. Her character designer is Morikura En (post #2638467), while her voice actor is kept a secret. She made her debut with the video Creating A Twitter account! on November 29, 2016. Her 3D model is available for download from her official website. She describes herself as a 16 year-old super intelligent A.I. that is curious about humans. As the sole resident of an endless white void, she finds human life fascinating, and wishes to use her channel to learn more about them. 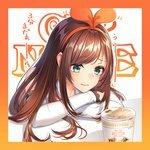 In a live stream celebrating a new subscriber milestone, Kizuna Ai gave her impression of her own three-sizes: 83-56-81.